Very cold hardy. Becomes dormant in winter. If desired, drench with a liquid organic fertilizer in spring, after new growth appears, and again in late summer. Carrot, Apple, Garlic, Onion, Onions and Beet. Start with a purchased clump, or start seeds indoors and set out while the soil is still cool. 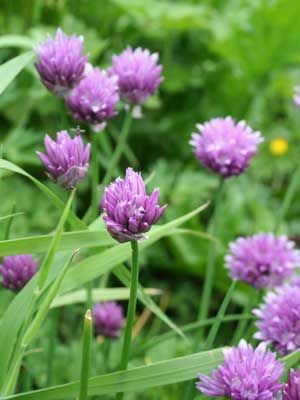 Established clumps can be dug and divided in spring or in fall. Established clumps produce beautiful pink flowers in late spring. Use scissors to gather handfuls of leaves from early spring onward. Rinse, pat dry, and snip or cut into smaller pieces. Can be invasive in cold climates. Snip off flowers to prevent unwanted reseeding.